Just one more 3x3 valentine... 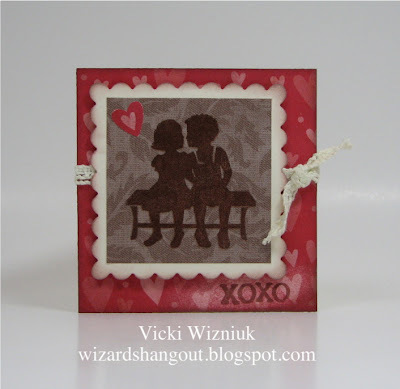 This image from the Childhood Portrait stamp set needed to be on a valentine! Supplies used (all CTMH unless otherwise noted): Childhood Portrait, Soul Mates stamp sets; Animal Cookies, That's Amore B&Ts; Colonial White CS; Chocolate, Versamark inks; Clear Detail embossing powder; Colonial White crochet ribbon; Scallop scissors (retired); Heart to Heart punch (SU); 3D foam tape (other). Vicki this card is so beautiful. I love this stamp set too. I think I may have to make some of these - they are adorable. Always a treat to visit your blog. This could be my very favorite thing I've seen with those shadow stamps! Way to go!